Social sharing service Buffer has signaled its intention to bring its technology to the Web’s top services after it announced a partnership with Feedly, with what its founders hope will be the first of a number of integrations with social newsreader services. The San Francisco-based startup has also broken the 500,000 registered user mark. Buffer lets users schedule posts to Twitter, Facebook and other sites at pre-defined times, to space out their updates and avoid congested sharing. The deal brings its social sharing button into Feedly — a social reader for mobile and desktops — allowing its 3 million registered users to easily add new stories to their Buffer pending tray direct from the service. 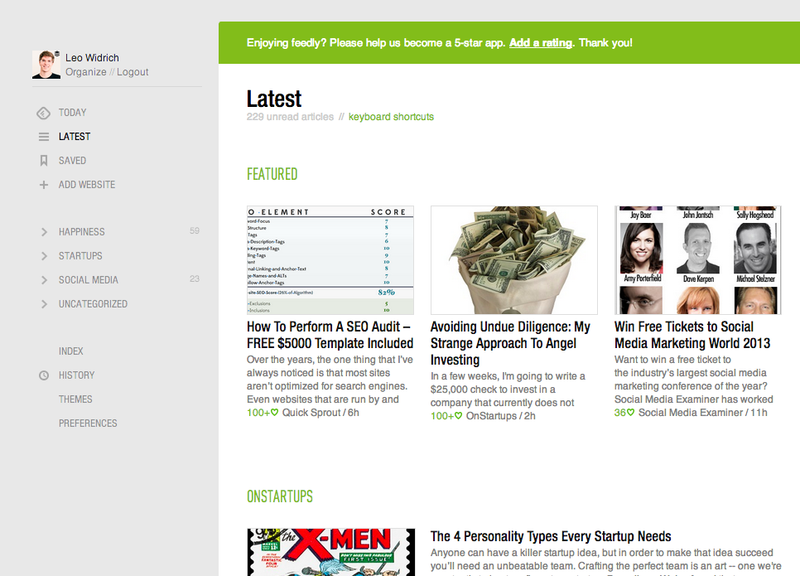 Those with a Buffer account simply log in via Feedly, and then share the selected content using the Buffer share button. Aside from its own website, which includes analytics relating to users’ shared content, Buffer has integrated with a number of platforms, including IFTT, BlackBerry 10, App.net (which it was first to do) and more. It also has Chrome extensions which provide native Facebook and Twitter integration, as well as Android and iOS mobile apps. The deal with Feedly is its first link-up with a social reader service, and that’s significant because the likes of Flipboard, Pulse, Taptu and Feedly have become important channels through which socially savvy Internet users read their news. That’s exactly the segment of users that the concept of Buffer resonates best with. Co-founder Leo Widrich told TNW that the deal signals a new stage in Buffer’s development. “This is a new road for us and we’re focused on broadening our sharing. We’re keen to hook into sites and places that people already use,” Austrian-born Widrich said, explaining that the team wants to bring its service to the Web, to cause minimum disruption to a user’s regular Web habits. Feedly underwent a beautiful redesign in September 2012 and, while it has been around since mid-2008, newer services like Flipboard have stolen its limelight. Widrich revealed that Buffer is in the process of reaching out to other news readers — he specifically mentions Flipboard and Pulse — with a view to introducing similar integrations with their services. Though Buffer’s share button isn’t as well used as those of top-draw sites like Twitter and Facebook (though you’ll find it here on TNW), the deal is a win-win for both sides. Feedly gives its users a more flexible option for sharing, while Buffer can provide its service to Feedly users from a place where they spend a lot of time. Widrich explained that an extended test among Buffer’s ‘top’ users using a lightweight Feedly-Buffer integration brought in around 5,000 shares per week. That clearly demonstrated the potential for Feedly, and Buffer will likely adopt a similar pitch with the Web’s more illustrious social news aggregators, and Flipboard in particular. Buffer revealed it had reached 400,000 registered users when its Web client and mobile apps underwent a significant redesign in December, and it has added 100,000 new sign-ups in the corresponding six weeks. Widrich said that has consistently grown at a rate of 15-20 percent over the past 18 months or so, and that growth, coupled with the fact that it is making $1 million in revenue per year, helped it land a $400,000 seed funding round in December 2012. The company makes its money through premium accounts — which include more detailed analytics — and some 2 percent of its user base are paying customers. The company is now at the point of breaking even and that has meant most of that seed round is still in the bank. That puts the founders in the enviable position of “being able to turn down VCs”, Widrich explains. There’s no immediate plan to raise more investment, although Widrich suggested that it could be an option that is explored at the end of 2013. For now, the primary goal is to grow to 5 and 10 million users, and continue to integrate the service into more services to make it more convenient to use. Buffer has plans to increase its team of seven with four or five new staff in the coming weeks. The team is particularly keen to hire worldwide to put it in a position to provide customer feedback 24/7. “The key for us is to build a great experience for our users, both when they use the service and when they engage with us,” Widrich said. We’ve kept an eye on Buffer since it was a tiny startup with two founders spread across Europe, and it will be fascinating to see if it can strike deals with the Web’s biggest services to bring its unique social sharing system to more users.